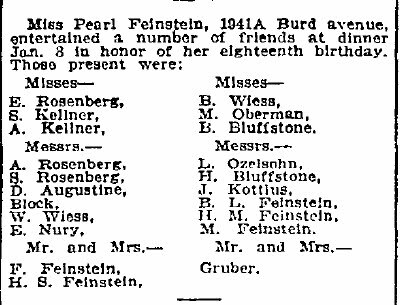 1) Pearl Feinstein was the sister of my great grandfather, Herman. I don't have an exact birth date for her. The 1900 census says Nov 1890. Her tombstone says 1891. This newspaper article implies she celebrated in early January. 2) The address matches information for the family in city directories from the time. 3) I can identify some, but not all of the guests at her party. Her brothers Harry S., Herman M., Benjamin L., and Morris, are easy. Her father, Selig, is likely misreported here as F. Feinstein. 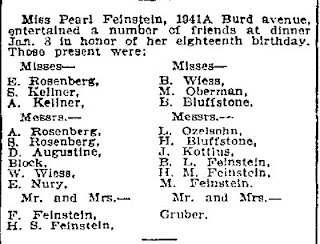 Since the party was at the Feinstein home, Pearl's younger siblings, Rose and Aaron were almost definitely there. It must have been decided they weren't old enough to name. 4) M. Oberman and L. Ozelsohn are likely Pearl's first cousins, Minnie Oberman and Louis Odelsohn. Why they are the only cousins from those two families who showed up is unclear. Minnie's mother, Toba, and Louis's father, Julius, were the siblings of Selig. Julius and Selig both changed their surnames from Dudelsack upon arriving in America. 5) I am also slightly curious as to the identity of Mr.and Mrs. Gruber. Likely they are friends of Pearl's -- not uncommon at age 18, especially during this time period. However, it is also possible the wife of this couple is a relative. Travis - interesting postcard. I wonder what the 'squares' referenced.